As you have noticed my last posts are months out of date. But this one I couldn't miss. It's not the first time I refer my friend Ana Maria Morgado. 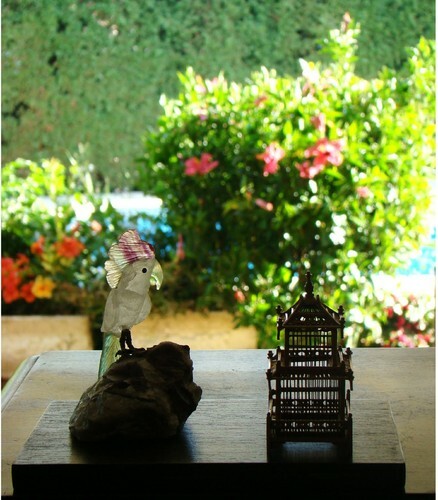 She is an amazing miniaturist as well as very good artist with photos. Last summer to celebrate her birthday I offer her one piece I made express for her. 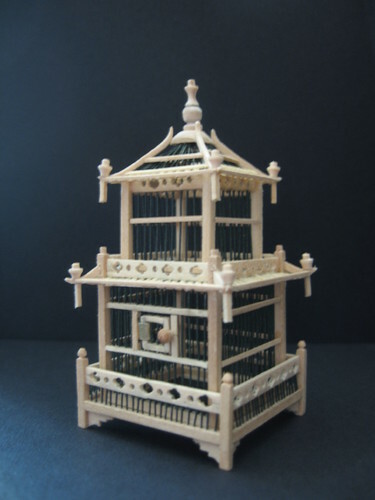 A birdcage. She deserves this and more. She is one of the most important persons for my miniature work. Always encouraging me to go further, always looking for something that can helps me (books, materials, ideas, general information). For the last two years she was my companion in the miniature shows adventure. We shared the tables and we build together a few pieces. Her hand paintings are simply magnificent! Her last Blog is wonderful! Great work, Ana Maria! Congratulations! And now, look the "poem" she did with the same piece!!! I never had a so beautiful photo in my blog! Thank you my friend!
. ANA MARIA MORGADO - "AM- AMBIENTES - EM MINIATURA"
. SOFIA - " A MINHA CASA EM MINIATURA"
. SOFIA - " O MUNDO DE ZAPHIA"
. ANA MARIA MORGADO - "ARTES E MINIATURAS"
. ANA NOVO - "TINY DELIGHTS"
. ANA MARIA MORGADO - "AM-BONECAS E COMPANHIA"
. ANA NOVO - "ALL TINY DELIGHTS"
. BIBY - "BIBY CASA DE BONECAS"
. MARINA - "CASA DE BONECAS & MINIATURAS"
. ELIS - "MINIS - MY SECOND LIFE"
. MARIA PAULA - "SÈNES EN SEINE"